Vacation and work have left me with no backlog of Downey Daily pictures. Which explains why, after a full day of work and dinner out with my parents, I'm driving around Downey at 9pm looking for a picture. As is often the case at night, I'm drawn to downtown Downey. 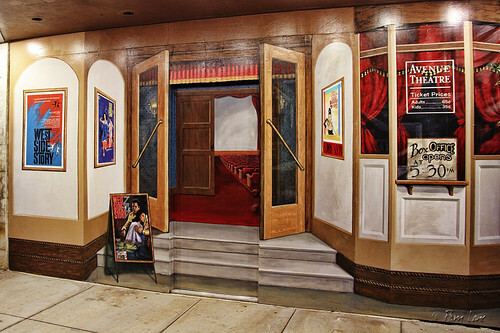 And the first thing I notice, with its bright marquee lights, is the completed Avenue Theater mural. (You can see the work in progress in Joan's post from a few weeks ago.) It looks inviting enough to walk on in. I wonder if 65 cents was expensive when West Side Story played here in the 1960s. 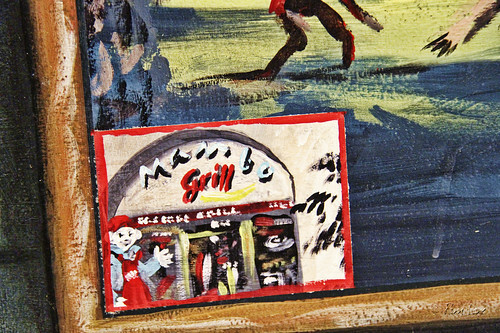 In the closeup of the movie poster, you'll see Mr. Mambo. I'll introduce you to today's Mr. Mambo on Sunday.